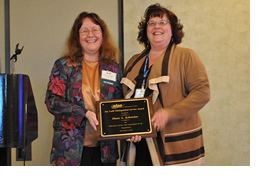 Congratulations to Diane Schrecker, Curriculum Librarian, Ashland University, who received the Jay Ladd Distinguised Service Award during the 2011 Annual Conference. Past President Rocki Strader presented the award, citing Diane’s long service to ALAO as Secretary, Curriculum Materials Center Interest Group Chair, Program Planning Committee member (for many conferences), member of the Research and Publications Committee, and as a frequent presenter at annual conference, workshops, and in poster sessions. Diane was described in the nomination letter as a “top-notch professional” who never fails to promote ALAO activities, especially on the Library Cloud blog. As an author, committee and board member, conference presenter and workshop host, she “serves to help other library professionals grow and learn.” See Peggy Rector’s photo of Rocki Strader presenting the award to Diane Schrecker on Flickr, along with dozens of other photographs from the annual conference.